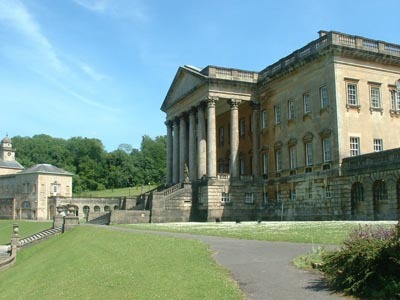 Baldersby Park is said to be the first Palladian style villa to be built in England. Colen Campell was commissioned to design the house for Sir William Robinson, a York MP and former Lord Mayor and the front façade is still considered to be one of the finest of its kind in Britain. The house took three years to build and consists of three separate sections, joined by corridors. In 1900 it was sold to John Brennand, a cotton magnate. Mr Brennand’s banners are once again hanging in the Baldersby chapel having been returned to the school by an old girl who discovered them in a South African auction. 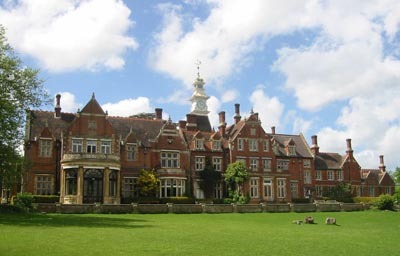 The house remained a private residence until 1927 when it was converted into a boarding school for girls. 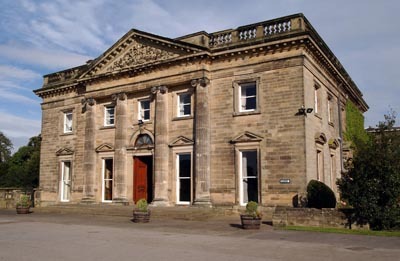 The girls vacated the premises during the Second World War and Baldersby Park became home to the Canadian Air Force. The mansion house at Motcombe Park in Dorset, was originally the home of Richard Grosvenor, the younger brother of the First Duke of Westminster. Built on the site of an existing building, the house was designed by architects Ernest George and Peto, assisted by Ethel Mary Charles – Britain’s first qualified woman architect. One million bricks were used to complete the Tudor-style building and it was eventually completed in 1895. The house had Ham Hill stone dressings and was situated in charming park-like grounds, planted with rhododendrons. An advertisement for Tongswood, Hawkhurst in Country Life on October 19, 1935 described it as one of the finest residential, agricultural and sporting estates of its size in Kent or Sussex. The Jacobean house is approached by a majestic sweeping drive through acres of private woodland and parkland. In 1935 the estate of C.E Gunther (of OXO fame) sold the property to W B Harris, who bought it with the sole purpose of housing Saint Ronan’s School- a prep school which has remained at Tongswood ever since. Walnut panelling still lines most of the reception rooms and the polished oak parquet floors still exist, sometimes under well worn carpets. The 50ft ballroom – known fondly by the children as the ‘great space’ – has an elaborately decorated ceiling and sprung floor. The 24 bedrooms and dressing rooms and eleven bathrooms mentioned in the sale particulars have been converted into classrooms- all with their own particular name and character ,ranging from the ‘Bogey Hole’ and ‘Bear Garden’ to the ‘Zoo’ and ‘Lady Vas’s bedroom’. The servant’s quarters are now dormitories – no doubt much more comfortable than they were in their previous incarnation. 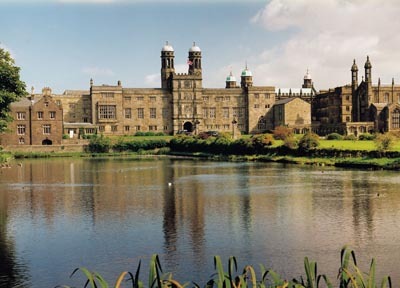 Stonyhurst has attracted Country Life’s attention on three previous occasions – it featured in the magazine in 1910 and twice in 1938 and Pevsner heralded it ‘the finest example of scholastic architecture in England’. Today the building is the second largest habitable building under one roof in England: ‘it is strange to find a school with no coat pegs,’ said a spokesperson for the school. The original Stonyhurst mansion dated from 1200 but in 1592 a rebuilding scheme commenced – to a grand, symmetrical Tudor plan. Lack of funds forced work to stop in 1606, and the house stood half finished for the duration of the 1640s. When Oliver Cromwell stayed in the house in 1648 he pronounced it the finest ‘half house’ he had ever seen. It was in this unfinished state that the house became a school in 1794. Hard times had hit the owners in the 1790s and several priceless Nost statues were melted down to provide lead for the roof. Temporary farmhouse style buildings were constructed to house the community, one of which is today a Grade II listed part of the building. Oliver Cromwell might well have disapproved of the addition but he would be proud of the front quadrangle, finally finished in the 1840s in exact symmetry with the original half building. Few houses have been owned by such a wealth of kings and queens as this palatial building. 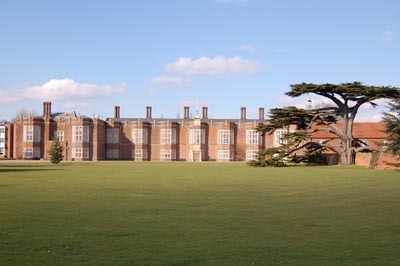 Having started life as a working manor in 1062, New Hall became royal property in 1450. The Royal Arms of Henry VIII can still be seen in the chapel and the house was home to Mary Tudor for a number of years. In the seventeenth century Oliver Cromwell bought the New Hall estate for a meagre five shillings and at restoration in 1660, it was granted to George Monck, first Duke of Albermarle. According to records, King Charles II and his Court were treated to Monk’s hospitality at New Hall on many occasions. A charming legend documents the origins of this Hogwarts-style castle – but no evidence exists to prove it. The original house on Towers’ site was bequeathed to a gallant coachman upon the death of its widow owner. 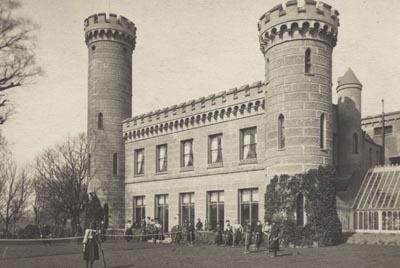 Delighted to have come into riches, the coachman duly decided to build himself a castle and commissioned architect George Smith to design it. Sadly, after spending an impressive £24,000, the funds dried up and the coachman was forced to sell the unfinished castle to Mr Smith. Towers was completed in a far more economical way than originally planned which accounts for the absent fourth tower. Ralph Allen, who owned stone quarries in the Bath area, commissioned this Palladian masterpiece in 1798 as a way of advertising his stone. John Wood the Elder was drafted in to create a mansion in Georgian style on stunning parkland overlooking Bath and no expense was spared in the materials used. The building was transformed into a school in 1924 and today it is an independent Catholic school with equal numbers of girls and boys. Huge pillars and high ceilings with intricate plasterwork and mouldings can be found throughout the building, creating an inspirational learning environment. ‘The children are always discovering new things – every time you turn a corner you come across a statue or a beautiful fireplace,’ says a spokesperson for the school, ‘It is great for art classes.’ The chapel, a nineteenth century addition, is still in use today, as is the vast Victorian chandelier hanging in the library. 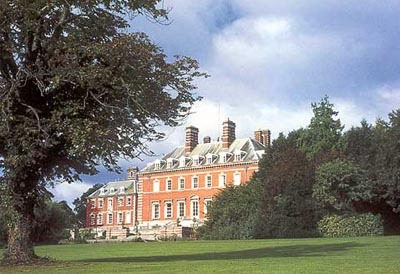 Bryanston House was not built to blend in with the Dorset countryside – its red brick façade stands out like a beacon. Designed purely to reflect the wealth and importance of its owner, the second Lord Portman, the Victorian mansion is a picture of Victorian excess. Renowned nineteenth century architect Norman Shaw was commissioned to create the house in French Renaissance style and the finished article is modelled on the Loire chateau of Ménars. The imposing façades and wings are covered in intricate decoration and the French theme continues inside with magnificent baroque ceilings and wood work. Legend has it that Lady Portman landscaped the garden from an upstairs window; signalling with flags where she wanted the trees in order to obscure the view of Blandford. The introduction of death duties in 1919 financially destroyed the Portman family and in 1931 the house became an independent boys’ school.